The Fisher-Price Bubble Mower is great for developing gross motor skills. Kids will push, pull and twist the life-like controls while the all-terrain tires roll steady for tougher traction on grass and other surfaces. Product Description: The Fisher-Price all new Bubble Mower will keep bubbles blowin’ for a whole lot of mowin’! Your child will feel just like a grown-up when they turn the electric start key, push the realistic throttle and “mow” almost anywhere thanks to all –terrain tires that give tougher traction on long grass, gravel and carpet. For children ages 2-5 years. VvvRRrooOOM, VvvRRrooOOM sounds make the cool realism complete! And while they’re goin’, they’re blowin’ loads of bubble fun! Now, with its new bigger bubble dispenser there’ll be fewer re-fills. Plus, a deeper bottle well means fewer spills! And when the bubble well runs dry, all your child has to do is just tap the bottle once for a quick no-mess refill. From the moment your child gets behind the Bubble Mower to give it the first push, they’ll have a new favorite go-anywhere toy. They’ll push, pull and twist the life-like controls, love the charming motor sounds and be fascinated by the steady stream of bubbles. In fact, there’s so much fun going on that even without the bubbles –for inside play – the Fisher-Price Bubble Mower is guaranteed to keep your child moving and smiling for years. With or without bubbles, inside or outside, kids will love pushing the Bubble Mower around, hearing the pleasant “engine” noise, and feeling like they’re just like Mom or Dad. And grown-ups will love how sturdy, stable and durable the Bubble Mower is – a toy made for years of fun! Watching their faces light up as they explore, discover, play … all those moments when children learn best. That’s why Fisher-Price® builds learning into everything we make. With playful ways to engage curious minds, exercise little bodies, and nurture budding personalities. Because nothing’s more amazing than sharing the joy of learning with your child. 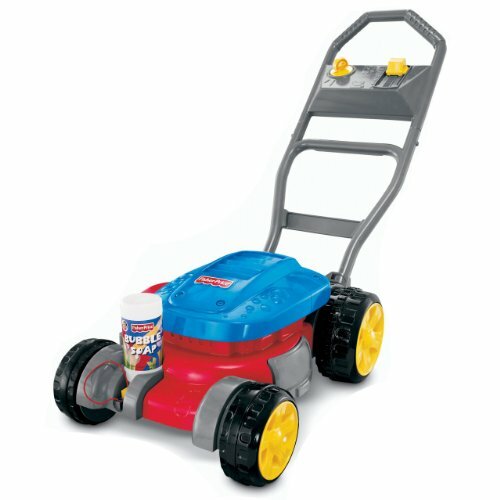 Fisher-price Bubble Mower and bubble solution.